MUNICH, Germany and LAS VEGAS, Nevada – January 8, 2019 – Maxim Integrated Products, Inc. (NASDAQ: MXIM) today announced power-management ICs offering the industry’s smallest solution size and highest efficiency to help automotive designers meet space and power challenges of next-generation automotive applications. As digital instrument clusters, radio head units and electronic subsystems require ever higher levels of compute power, these new high-power buck converters and high-power, multiphase buck controllers empower designers to balance low power consumption with high efficiency and electromagnetic interference (EMI) mitigation. As automotive systems become more sophisticated with increasing levels of electronic components, higher power microprocessors are required to control and supervise their functionality. 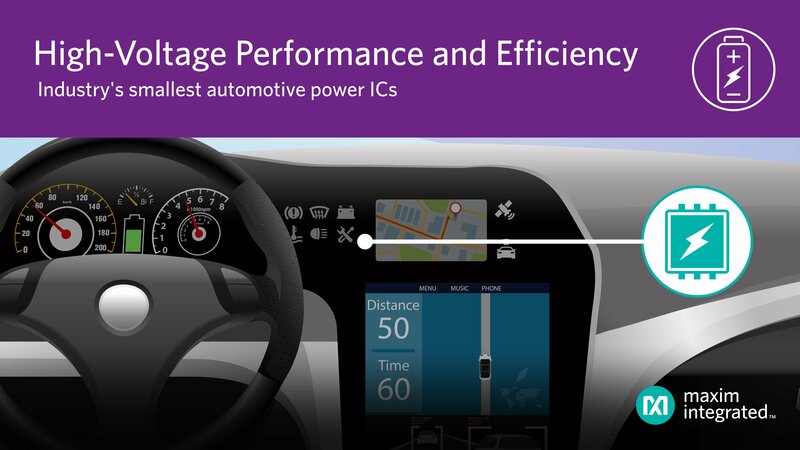 This adoption of more powerful instrument clusters, USB hubs, advanced driver assistance systems (ADAS) and infotainment and navigation systems is driving 10 percent annual growth for power-management ICs through 2026, according to analyst firm IHS Markit. This growth pattern is presenting designers with multiple challenges for managing power consumption, efficiency, EMI and solution size to achieve the performance needed in harsh, space-constrained automotive operating environments. 3.75mm, Maxim’s buck converters offer the industry’s smallest solution size. Their flip-chip quad-flat no-leads (FCQFN) packaging reduces high-frequency switch node ringing and eliminates bond wires to lower MOSFET switch on-resistance and increase efficiency. Maxim offers the industry’s only pin-compatible parts for four, six and eight amps for flexible power regulation. All of the ICs feature spread-spectrum modulation, high switching frequency, forced pulse-width modulation and skip-mode operation for best-in-class performance. MAX20004, MAX20006 and MAX20008 4A, 6A and 8A high-voltage (40V tolerant) synchronous buck converters with integrated high-side and low-side MOSFETs, offering the industry’s lowest switch resistance of 38 and 18 mΩ, respectively, for high efficiency. Key advantages of these pin-compatible devices include 25µA quiescent current, operating input voltages from 3.5V to 36V and 93 percent peak efficiency. All are available in a compact 3.5mm x 3.75mm, 17-pin side-wettable QFN package that reduces high-frequency switch node and improves efficiency. MAX20098 220kHz to 2.2MHz synchronous buck controller for applications with mid- to high-power requirements operating with input voltages from 3.5V to 36V (42V tolerant). For efficiency, this device features a quiescent current of 3.5µA in skip mode at 3.3V output along with a 1µA typical shutdown current specification. Its 3mm x 3mm side-wettable QFN package reduces solution size, and the IC requires few external components, enabling a two-layer PCB design. MAX20034 220kHz to 2.2MHz dual synchronous buck controller for high-voltage applications operating with input voltages from 3.5V to 36V (42V tolerant), where one regulator will operate as a fixed 5V or 3.3V output and the other output is adjustable between 1V to 10V. Key efficiency advantages include 17µA quiescent current in skip mode and 6.5µA typical shutdown current. The device is available in a 5mm x 5mm side-wettable QFN package, and it provides up to 2.2MHz switching frequency to enable smaller external components and total solution size. For availability and pricing information, please visit the individual product pages to inquire about specific products and evaluation kits.